Note: This post was originally published (by me) on May 22 2014 on Linkedin. You can navigate to the original post by clicking here. Determine “Lessons Learned” – how can future projects benefit from mistakes made or new “best practices” that have been identified as part of the current effort? Determine whether or not the project was “effectively managed” and was run according to pre-agreed standards (these tend to vary, but invariably follow the same set of precepts). Determine whether or not project objectives were met and anticipated benefits were ultimately delivered. “All good stuff” you might think. And it is. But this is where the fun begins. When the next project is kicked-off, we expect everyone will automatically be familiar with the updated list of “Lessons Learned“, that people will actually fine-tune their future behavior to incorporate the findings and we also assume that the larger problems identified in the PIR will have been addressed as a matter of course. are more than likely large enough to warrant their own remediation projects if deemed insufficient. These remedial projects rarely happen given the already full “book of work” and so the same problems tend to persist. They wreak the same havoc on project after project – time and money are invariably wasted. which would normally dictate additional training, are often overlooked. A major false-economy in my opinion. Benefits are also sometimes difficult to gauge when only a 90% solution has been delivered. Hidden work – and hidden costs – plus antiquated systems persisting past their life expectancy – along with tactical workarounds (some manual, some automated) make an accurate benefits assessment subjective at best. Constant flux provides the real challenge. 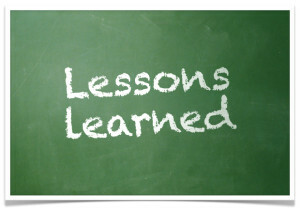 From my point of view, collating the “Lessons Learned” is often one of the only objectives that is ever effectively realized and this is where it gets really tragic (and interesting). Companies spend vast amounts acquiring tremendously powerful knowledge and – despite the recommendations of every Project Management framework – then ignore it when it’s time to actually leverage that knowledge. Would you, using some extreme examples, attempt to walk/run across the Sahara or swim the Channel without intense preparation, research and training? Not likely. So why do so many Project Managers ignore this crucial first step of discovery? So – how do we become more effective? How do we really incorporate “Lessons Learned” and break the vicious cycle? At a minimum, scouring the Firm’s knowledge-base or PIR Repository (assuming you have one) should be the first order of business when embarking upon any new project. If you know what you’re up against, you then at least have a fighting chance. Bake this discipline into your Project Initiation schedule and promise yourself never to short-change the effort. What do you think? What happens where you work? Please feel free to comment. Previous PostCEAVOPNext PostOk.. So I’ve setup a new website.. installed a few widgets and decided to “give this a go”..